Also known as the eight modern wonder of the world. The Alhambra is the most visited monument in all of Spain, with close to 3 and half million visitors every year. The origins of the Alhambra are believed to date back to Roman times. However the palaces and gardens were reconstructed during the Nasrid dynasty (13th – 15th centuries). It was transformed into a self-sufficient city boasting fertile gardens, a functioning irrigation system and opulent luxury. On January 2nd 1492 the army of the catholic monarchy (Fernando and Isabel) marched into Granada and the last stronghold of Moorish Spain came to an end. The Alcazaba – is the oldest part of the citadel and its watchtower yields spectacular views of the Albaicín and the city below. The Palace of Carlos V – is the youngest portion of the Alhambra, having been built in the Renaissance (1526). The Generalife – the Garden of the Architect, is set outside the main area and was once used as the royal summertime escape. At the Alhambra itself, tickets are on sale at the entrance only for the day of the visit. Be warned they sell out quickly, so get there early to avoid disappointment. The Cathedral of Granada is one of the most important buildings of the city and holds the remains of Isabel and Fernando, probably the most famous of all of the Spanish monarchy. Visitors can tour the Cathedral for its impressive architecture and visit the museum, which houses religious paintings from the 15th century, tapestries, and various articles formerly belonging to Catholic Kings. Las Cuevas del Sacromonte: The Museum of the Caves of Sacromonte showcase typical cave homes recreated with original objects and furniture, as well as caves utilized for traditional work in basketweaving and ceramics. The museum also host cultural events pertaining to the environment, flamenco, music, and the way of life in Granada. Memoria de Andalucía Using modern technology, the Memorial of Andalucia provides information on the landscape, history and culture of Andalusia through interactive, educational exhibits. Museo Arquelógico de Granada: The Archaeological Museum contains various findings from objects of late Roman tombs to the artifacts of the rich Hispano-Muslim period of the 10th-15th centuries. Collections also include a large number of pieces from throughout human history to provide a better understanding of human evolution and society development. Parque de las Ciencias: The Parque de las Ciencias is an interactive museum full of activities and demonstrations for learning about scientific principles. Installations such as “Journey through the Human Body” and “Sala Percepción” provide opportunities to experience biology first-hand and play with light and sound. Half of the museum is dedicated to temporary exhibitons of the highest international standards. Visitors often scramble to see the Albaicín (Albayzin), the barrio that originally made up Granada during Islamic rule and justifiably so. The Albaicín is famed for the markets and tea shops and it is easy to get lost in the winding cobblestone streets of this historic neighbourhood. In the 11th century, the inhabitants of a nearby town called Elvira abandoned ship and relocated themselves a few kilometers away to Granada, which had long been in ruins. These settlers belonged to the Banu Ziri dynasty, one of the independent Islamic dynasties of the Taifa period. Because the city was primarily built for defence, the Ziris designed the streets to be labyrinthine and narrow to give it a closed-off character and protect all the wealth inside. On closer inspection it appears that not much has changed over the years. The Albaicín is listed as a Unesco world heritage site and as such has strict rules regarding any new building or construction in the area. Federico García Lorca is undoubtedly one of Spain’s greatest dramatists and poets. 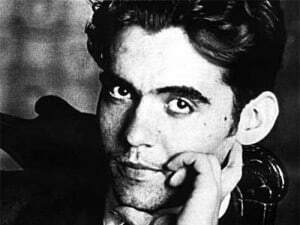 Lorca’s works have been translated into numerous language and continued to be performed world-wide. Furthermore, artists from Russia to North America and from Vietnam to Mexico have taken Lorca as inspiration for their own creations; the Spanish poet Antonio Machado wrote El Crimen Fue en Granada about Lorca’s death, Leonard Cohen’s song Take this Waltz, a translation of Lorca’s poem Pequeño vals vienés, reached number one in Spain in 1986, whilst films and plays have also been based on Lorca’s life and death. Mariana Pineda “the heroine of liberty” – Was one of the most emblematic figures in Spanish history. 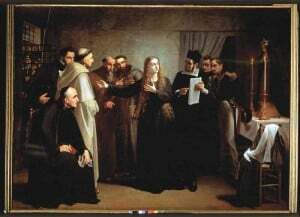 Pineda fought for the liberal movement of the 19th century and whose death turned her into a legend. After Fernando VII sentenced her to death, she was publicly executed near the Plaza de Triunfo with the brutal garrotte (el garrotte vil) , a Spanish iron collar used to strangle and break her neck.